When we were in Hilo we decided to find a room for the night so we wouldn't have to wake up as early before going out to the lava boat tour. 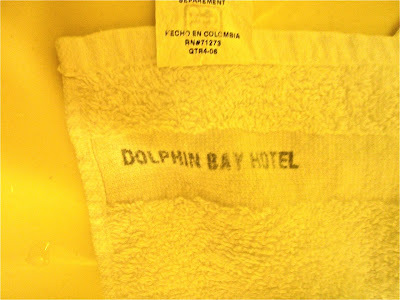 We found a room at the Dolphin Bay Hotel. 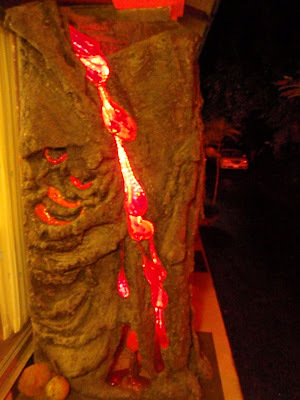 We knew we picked the right place because it had lava flowing in from of the office. It looked cooler at night. Also they had a bunch of papayas and bananas sitting outside the lobby just for the taking. you should google Hilo Hattie, she was big on the island when I was a kid..
Am I to understand that you 'borrowed' a towel from the hotel? Geez you should have taken the bed sheets and the lamp shade. 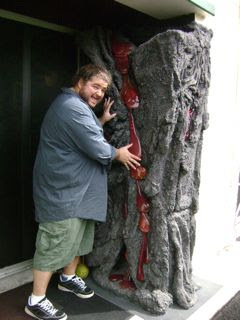 Glad you found a hotel so close to the lava that they use it as part of their outer decor, Jorge!